Recently, my wife and I watched a little documentary entitled “American Meat.” I call it little because it doesn’t look like much at first, but this lower budget documentary offers more than first meets the eye. I just happened upon it and the cover (complete with Joel Salatin cover) made me interested to view it. I was surprisingly refreshed both by the content and the way they chose to approach it. Documentaries often carry an air of theatricality. Perhaps that is really what makes this film stand apart, seemingly low budget in a good way. The goal in writing a documentary is usually to either reveal something in a shocking, journalistic manner or to bring a comforting, self-discovery. Any documentary about social woes and systematic problems is generally going to lean heavily on creating intense moods and starkly contrasting victims and monsters. Not so here. The film was an honest look at the farmers. Farmers across the spectrum. Farmers who have committed themselves wholeheartedly to industrial farming, farmers who are still relying on industrial farming but would love a better option they could rely on, farmers who have established alternative and highly functional farming methods (mainly Joel Salatin here), and younger people who are turning to farming and learning and innovating new methods. The thing that was so incredibly pleasant about this film was how positive it stayed. The question all along was simply “is this a good way and, if not, is there a feasible alternative method?” There is zero emphasis on the way the system has gotten so bad, or who is responsible for the flaws. There is only emphasis on understanding those who find themselves at the forefront of the problems, and gentle encouragement to believe that proactivity can create a real turn around. This film is utterly without pretense and completely bolsters your belief in humanity and the ability for relationships to breed community and the ability for community to produce national change. If you have watched Food Inc. and similar documentaries and find you have any interest in the food and farming situations current in the United States, I cannot recommend any documentary above this one. On a separate and similar note, I would encourage anyone seriously interested in getting hands on experience on a farm or getting back into the farming business to check out the Salatin family’s newest project, EagerFarmer. 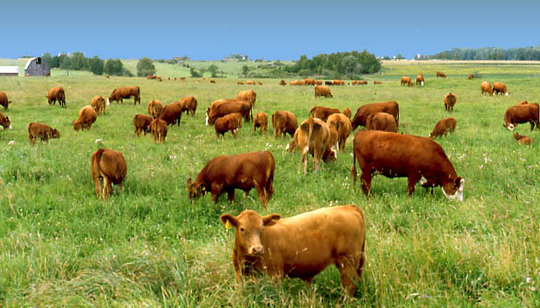 EagerFarmer could easily be the catalyst for the change American Meat proposes. It is basically a classified ad service for those looking to learn to farm, find gainful farm employment, find farm help, or get farmers on their unused land. I’ve been eagerly browsing and dreaming, and I encourage both in you. Thanks for posting about this documentary. I hadn’t heard of it before. Two other positive documentaries along the same lines that I’ve really enjoyed are “Tableland” and “One Man, One Cow, One Planet”. As you said, instead of lamenting the dire state of farming, they give success stories and show how it is possible to change things. Very empowering! Thanks for the tip! I’m always eager to get more inspired!